You are at:Home»Apple Watch»My Apple Watch Froze! Here’s The Real Fix. Your Apple Watch froze and you’re not sure why. You’ve tried pressing the Side button, the Digital Crown, and the display, but nothing is happening! In this article, I’ll explain what to do when your Apple Watch is frozen and show you how to fix the problem for good. Hard resetting your frozen Apple Watch will force it to turn off and immediately back on, which will temporarily fix the problem. To hard reset your Apple Watch, simultaneously press and hold the Digital Crown and Side button until the Apple logo appears on the screen. Typically you have to hold both buttons for about 10 seconds, but don’t be surprised if you end up holding both buttons down for 15-20 seconds! I want to emphasize that this is a temporary fix because most of the time when your Apple Watch freezes, there’s a deeper software issue causing the problem. If you only perform a hard reset on your Apple Watch, the freezing problem may come back eventually. 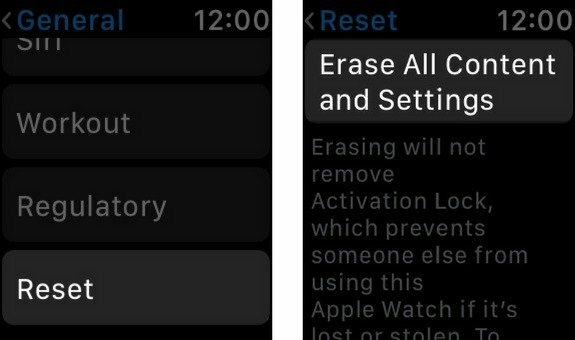 The steps below will help you take further action to prevent your Apple Watch from freezing again! One reason why your Apple Watch may keep freezing is because it’s running an outdated version of watchOS, the software that controls everything on your Apple Watch. To check for a watchOS update, open the Watch app on your iPhone and tap on the My Watch tab at the bottom of the display. Then, tap General -> Software Update. 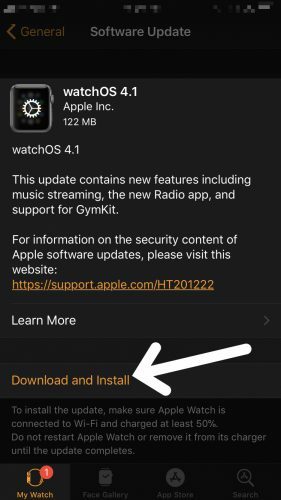 If a watchOS update is available, tap Download and Install. Note: Before you update watchOS, make sure your iPhone is connected to Wi-Fi and that your Apple Watch is either charging or has more than 50% battery life. Is There A Specific App Making Your Apple Watch Freeze? 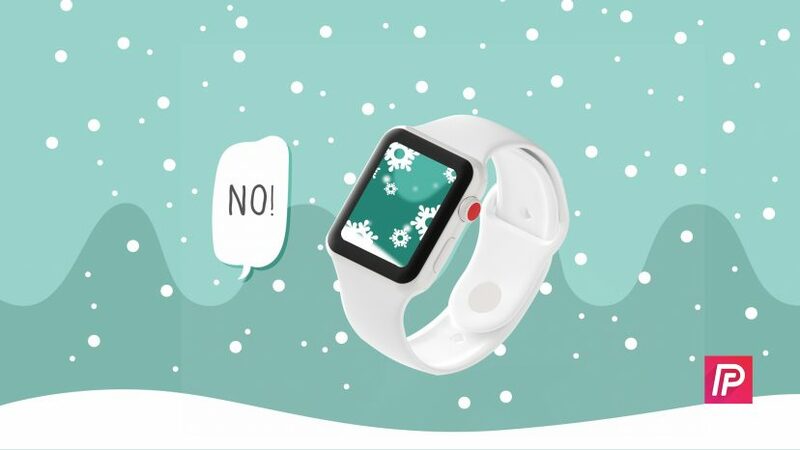 If your Apple Watch froze or consistently freezes when you use a specific app, there may be an issue with that app and not your Apple Watch. If it’s an app you can live without, you may want to consider deleting it. To delete an app on your Apple Watch, press the Digital Crown to view all of your apps. If you haven’t already, make sure you’re viewing your apps in Grid View rather than List View. 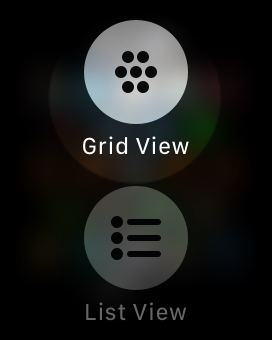 If your apps are still in List View, press and hold on the display of your Apple Watch, then tap Grid View. Next, lightly press and hold an app icon until all your apps begin to shake. To delete an app, tap on the small X on the upper left-hand side of the app icon. If your Apple Watch keeps freezing, there may be an underlying software issue causing the problem. We can eliminate this potential issue by erasing all the content and settings on your Apple Watch. When you erase all content and settings your Apple Watch, everything in the Settings app on your Apple Watch will be reset to factory defaults and its content (music, watch Faces, etc.) will be completely erased. Furthermore, you’ll have to pair your Apple Watch to your iPhone again. Think of it like taking your Apple Watch out of the box for the very first time. To erase all content and settings, open the Settings app on your Apple Watch and tap General -> Reset -> Erase All Content and Settings. Enter your passcode, then tap Erase All Content and Settings when the confirmation alert pops up on the display. 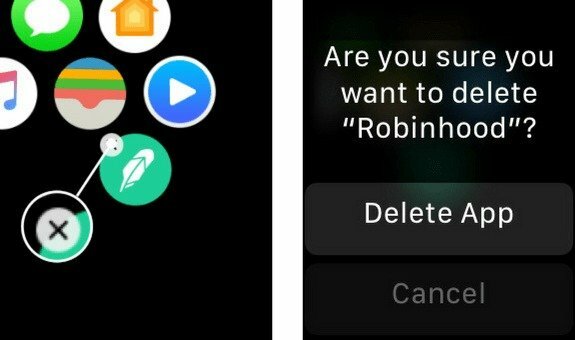 Your Apple Watch will erase all of its content and settings, then reboot. If your Apple Watch keeps freezing even after you’ve worked through these steps, there may be a hardware issue causing the problem. If you’ve recently dropped your Apple Watch, or if it has been exposed to water, the internal components of your Apple Watch may be damaged or broken. If your Apple Watch does have a hardware issue, take it into your local Apple Store and have them take a look at it. Remember to schedule an appointment first to make sure you don’t have wait around all afternoon! Your Apple Watch is no longer frozen and it’s working normally again! If you know someone who has a frozen Apple Watch, make sure you share this article with them. If you have other questions about your Apple Watch, leave them in the comments section below. Next Article Apple Watch Not Vibrating? Here’s Why & The Fix!